What do Rio de Janeiro and New York have in common? Weather-wise, probably not much. But when it comes to startups, it turns out they share quite a lot. Since July, both cities have even been sharing an accelerator, 21212, which we recently listed as one of ‘9 Latin American Accelerator Programs You Should Know‘. Now that a few months have passed since its launch, we decided to take a look at what’s going on inside 21212. Beyond its focus on digital projects, 21212’s biggest differential is its connection with the US, and most specifically with NYC – 21 is Rio’s area code and 212 is New York’s. According to its American co-founder, the entrepreneur and angel investor Benjamin White, the two cities could learn from each other: both are underdogs in their countries, and both are gaining more and more momentum. Yet, more can be done to connect New York and Latin America (see our previous post about another initiative, ‘When Latin America meets New York to talk startups‘.) 21212 wants to fill up this space; it has offices in Rio and New York, and the ambition to build bridges between the two cities. During this first cycle, it is more focused on Rio, but its team definitely considers bringing Brazilian startups to New York in the future, hence its US physical offices. When I asked Benjamin about the motivations of the first wave of Americans involved with the project, he acknowledged most have a personal connection with Brazil – often a spouse. Yet, there’s more to the story than pure philanthropy to develop the local ecosystem. According to Benjamin, there’s also an excitement about being early to the market. Like many foreigners, he believes firmly in the potential of a city like Rio, which is much more attractive to expats than Sao Paulo. Although 21212 is a classical accelerator, it works differently from TechStars, of which Benjamin is also a mentor. Indeed, 21212 has a team of 10 in Rio, which means it’s much more hands-on than its American counterparts. According to Benjamin, that’s what the Brazilian startup ecosystem needs at this stage. Once the startups finish the acceleration cycle, he is hopeful they will be investment-ready and vetted for the many US investors looking at the Brazilian market. He also hopes that the mentoring process will help turn more Brazilian successful entrepreneurs into investors, which is less common in Brazil than in the US. 21212’s selection process started in July and the program received 115 applications from all over Brazil. Although the number is already pretty high, it is likely to increase in the future when 21212 has a proven track record. One particular Brazilian entrepreneur told me off the record that he was waiting to see the results of 21212’s first class before applying. As he acknowledged himself, it has nothing to do with 21212’s founders, who have largely proven themselves as successful entrepreneurs – the Brazilians Marcelo Sales and Rafael Duton have co-founded Movile, part of the Endeavor (see our post 10 Latin American Startups You Should Watch For); but the recent boom of accelerators in Brazil has left early stage startups wary, as their teams want to make sure they chose the best option before giving away equity in their company. In this context, 21212 has been doing its best to establish itself as a trusted accelerator – starting with its selection process. After screening and interviewing applicants during one month, it shortlisted 20 companies, which pitched their project in front of eight judges, half of which came especially from the US. The jury went out and selected 10 startups, which are currently participating in 21212’s first acceleration cycle. Although these 10 companies have been taking part in the program for a couple months, 21212 only disclosed their identity a few days ago. Not that it has a taste for secret – on the contrary, its training sessions have been live streamed and posted on 21212’s blog, with the intent of democratizing knowledge. Ainda Tem – Your one stop to securely buy or sell tickets online. Ainda Tem is the first online marketplace for secondary market tickets in Brazil, connecting buyers and sellers of tickets for sports, concerts, theater and other live entertainment events. BES – Simplify, Connect, Reward. BES is an eLoyalty program platform for e-commerce retailers which provides tools for retailers who want to increase retention, referrals and revenues. Currently e-commerce stores face a big problem in shopping cart abandonment, which Bloompa is solving with a suite of social e-commerce tools that dramatically increase conversion rates. Craques.com – Connecting the soccer market. Craques.com is a global platform where soccer players and agents, managers, scouts and coaches from around the globe can search, communicate, share information and recommend each other. Helpin – Service that works. Helpin is a free service to find the best service providers. Igluu provides an end-to-end meal and grocery solution for its customers. iTrip – Aggregating travel packages through the web. iTrip is an online travel package aggregator organized by destinations and categories that allows travelers to compare a wide variety of tour packages offered by the top tour operators. ResolveAí – You think, we solve. ResolveAÍ is a virtual personal assistant which helps users finding what they need (cab, plane tickets, etc. ), at the price they want to pay. Simpply – Simplify direct sales, empower resellers. Simpply offers a solution for resellers with multi-brand operations, integrating brands, consolidating data, automating processes, and reducing management complexity and back office labor requirements. Vitalcred – Start accepting credit cards right now. Vitalcred is an e-payment online platform that allows self-employed and liberal professionals to accept credit cards for their fees and sales, through any cell phone, landline, and via Internet – anytime and everywhere. As soon as the program started, the selected companies moved in 21212’s new offices, whose infrastructure reminds of a garage, according to Frederico Lacerda, one of 21212’s co-founders. Four of them come from other cities than Rio – an achievement for 21212. When they joined the program, several of them were way beyond the idea stage, and a few of them had even reached break-even; yet, the majority are less than one year old. The main activity taking place at 21212 is mentoring; the accelerator already counts with the help of 25 mentors, of which only one third are Brazilians. Most mentors are “on the ground”, working closely with one, two or more companies depending on their availability and preferences. However, 21212 also enlisted a few mentors to come by once a month or so, and share their experience with the accelerated companies as a group. According to Frederico, foreign investors have also stopped by 21212’s offices more and more frequently to watch pitch sessions. One of the main consequences of acceleration and mentorship is pivoting, and Bloompa is an interesting example in this respect. According to Frederico, when 21212 selected Bloompa, it was particularly interested in its focus on social commerce. The company already had a product, which the team had launched at Sao Paulo’s Campus Party. Yet, this social network around shopping wish lists wasn’t taking off. When its founders Ricardo Dantas and Thiago Nascimento joined 21212, they already had a pivot in mind, to transform Bloompa into a recommendation network. Together, Bloompa and Fabio decided to zoom in and focus on a problem that social commerce could help solving: shopping cart abandonment, a serious concern for e-commerce websites like Fabio’s. From mentor, he also became Bloompa’s client: it’s on Camiseteria‘s website that Bloompa has started to test its MVP a few days ago, following the lean startup approach. Bloompa’s MVP consists of sharing buttons users can click on to get a discount if they go ahead with their purchase. Although its final product will of course be more complete, it already gives an idea of the new direction Bloompa is taking. According to Ricardo and Thiago, this pivot happened much faster within 21212 than it would otherwise have. Indeed, Bloompa was given plenty of opportunities to test its model with mentors, fellow accelerated startups, partners and clients. Although the pair met at an MBA in Tech Entrepreneurship, Ricardo said they learned more in a few weeks at 21212, thanks to the accelerator’s practical focus. Not all 21212’s companies have pivoted or needed to, but the majority did correct their strategy – a natural effect of constantly testing, measuring and validating business models. According to Frederico, the teams are now fully focused on execution and MVPs, with the goal to show early results by December – ahead of 21212’s Demo Day, scheduled for February 2012. 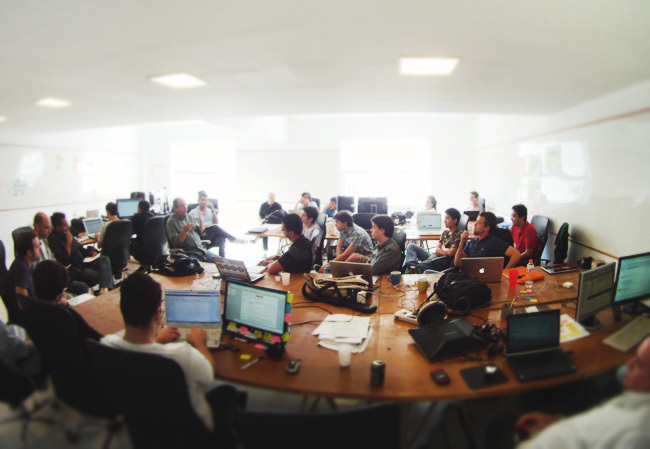 What do you think of the recent boom of accelerators in Latin America? Let us know in the comments.